A general contractor avoided what could have been a significant delay in the exterior shelling of a new multi-story retail building by finding twisted, missing and poorly aligned steel beams in the interior structure. 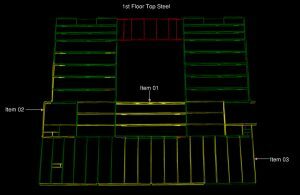 The company used automated construction verification software to analyze 3D laser scans of the steel framework to identify precisely where as-built conditions deviated from the design model—before the exterior shell crew arrived onsite. DPR Construction Inc., a commercial general contractor and construction management firm based in Redwood City, Calif., was called in to complete work on a three-story retail building in downtown Nashville, Tenn. A previous general contractor began the project by laying the cement slab and installing the steel embed bolts that would serve as anchors for the above-ground steel structure. Since DPR hadn’t been involved in the foundation construction, the firm decided to check the quality of the completed work, focusing specifically on installation of the embed bolts. These were of particular importance because the vertical steel I-beams, which soon would be installed, needed to tie into the bolts at grade. If the bolts were out of their designed alignment, the steel structure above also would be out of alignment. “We decided to scan the bolts and visually compare them to the design model, which is a typical way to perform a spot check,” says Tim Malys, project manager in the DPR Orlando, Fla., office. 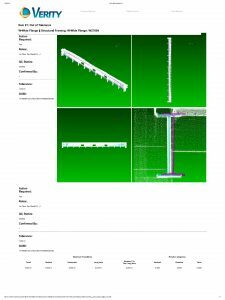 The DPR team used a Trimble TX8 laser scanner to collect 24 scans of the slab and 34 embed bolt locations. After processing the scans into a registered point cloud in Trimble RealWorks, DPR exported the data into Autodesk Navisworks. The point cloud was overlaid on the 3D design model supplied by the building architect for manual examination. Two embeds weren’t in their designed locations, another was installed out of skew by 15 degrees, and a fourth was missing entirely. DPR called back the original general contractor and had them reinstall the three incorrectly located bolts and epoxy drill-in the missing embed bolt. 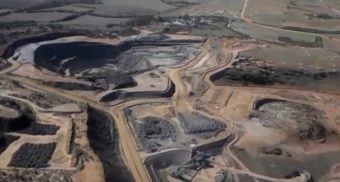 “That saved us two to three weeks of delay [that would have occurred] if the mistakes had been discovered after the steel construction began,” notes Malys. During the next several months, construction of the interior steel structure proceeded according to plan. Most of the horizontal and vertical elements were 20-foot-long I-beams. The skeleton included installation of nearly 600 beams forming three floors and a small open deck space on the roof. Verity’s overview feature provides an easy to understand “stoplight” coloring of the accuracy of the entire project. This time, however, DPR had a new tool at its disposal. 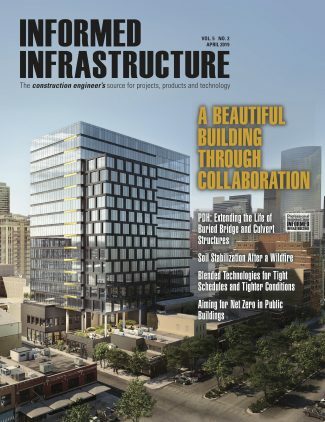 During the preceding few months, the firm had been participating in a beta program, testing Verity, a new automated construction verification software developed by ClearEdge3D, which leveraged and enhanced many of the company’s EdgeWise algorithms to automatically analyze construction quality by comparing an as-built 3D scan against the digital design model. Malys had enough familiarity with Verity to know that its analyses and measurements would be extremely exacting. Therefore, the scans would have to be tied accurately to the local coordinate system. Prior to bringing the laser-scanning team back onsite, DPR set up a series of targets on benchmarks in and around the steel structure so the scans could be registered accurately. 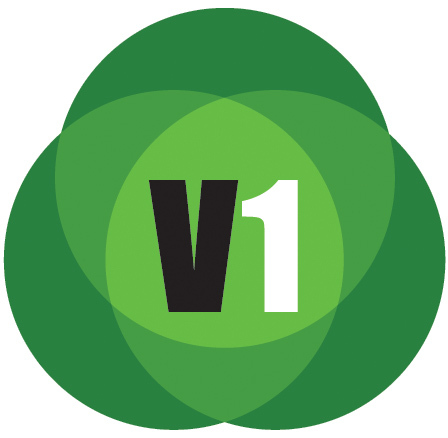 The Verity HTML report shows the precise accuracy detail of more than seven critical measurements. Only three items on the first floor were sufficiently out-of tolerance to require field inspection, but the problems compounded as the floors rose. The yellow structural elements were flagged as out-of-tolerance—some by more than a foot. After capturing 73 scans of the skeleton’s interior and exterior, the technicians processed the scans and created a single point cloud tied to the local coordinates. The point cloud and the original design model were loaded via plugin into the Autodesk Navisworks workflow for analysis by Verity. 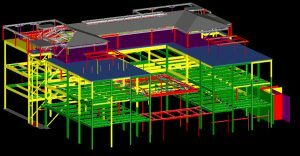 The software is capable of analyzing any or all architectural, structural or MEP features captured in a point cloud, but DPR set it to focus only on the structural steel elements, mostly horizontal and vertical beams. Malys chose a one-inch tolerance for the software to use when comparing the point cloud against the design model. Any element located more than one inch from its designed x, y or z position would be flagged as Out of Tolerance (OOT). He also set a maximum OOT limit of 18 inches. Any items not found within this parameter would be considered “Missing” by the software, which could mean that feature either hadn’t been installed at all or was installed far outside its designed location. Malys set the software to run overnight, and, in the next eight hours, Verity analyzed all 583 steel beams in the structure. It generated a written report as well as a color-coded schematic for viewing in Navisworks, showing variances for every member. In the results, each element was labeled as In Tolerance, Out of Tolerance or Missing. The results flagged half of the steel beams as being OOT, but, according to Malys, this was nothing to panic about. 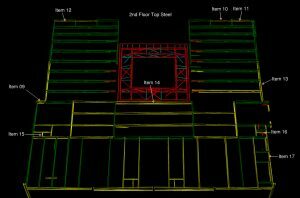 Cross beams and other features are routinely installed slightly out of design, and the Verity software was created to help general contractors such as DPR determine if any of the deviations are so severe that the structure’s safety or operation might be compromised. The software’s QA function allowed Malys to individually inspect the results for each flagged beam to see precisely how many inches it was OOT, in which direction and at what angle. The analysis even revealed where the horizontal beams sagged or the vertical beams had twists. DPR found the tolerance deviations cascaded upward from the ground, as is often the case in vertical structures where errors compound. These slight inaccuracies at grade then spilled over into increasingly larger deviations with each floor of steel installed above. “Nineteen beams were out of tolerance on the first floor, 39 on the second and more than half on the third,” notes Malys, adding that for similar projects in the future he would change the tolerance settings to allow for slightly greater deviations on each floor. While studying the OOT elements in the software QA window, DPR cleared most of them as posing no hazard to the building overall or the next phase of construction, which was the exterior shelling. But the team identified 45 elements that warranted onsite inspection. Architectural plans called for shelling the building exterior with glass and framing stucco. At the construction site, DPR personnel examined OOT elements that might prevent the shelling from being applied properly. If the exterior team found such problems when they arrived, they would likely have to delay their work while the issues were fixed. The most serious items identified by Verity and confirmed in the field were corners where two horizontal I-beams were supposed to be joined at a 90-degree angle, but was almost 10 degrees out of square. The software found a few beams that were skewed by up to 7 degrees, although they appeared fine to a casual observer on the ground. The deviations were, however, significant enough to distort the proper application of the stucco. 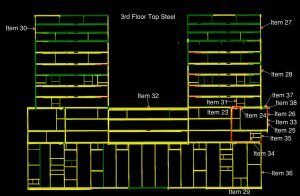 In addition to the corner details, the software identified several steel pieces that had been installed incorrectly above the top floor. They were supposed to have been installed at angles to allow for drainage from the roof, but instead were placed flat. These steel features were designated to be reinstalled prior to the roofing work. After structural fixes had been made and documented, Verity allowed users to reassign the modeled objects into their as-built locations. 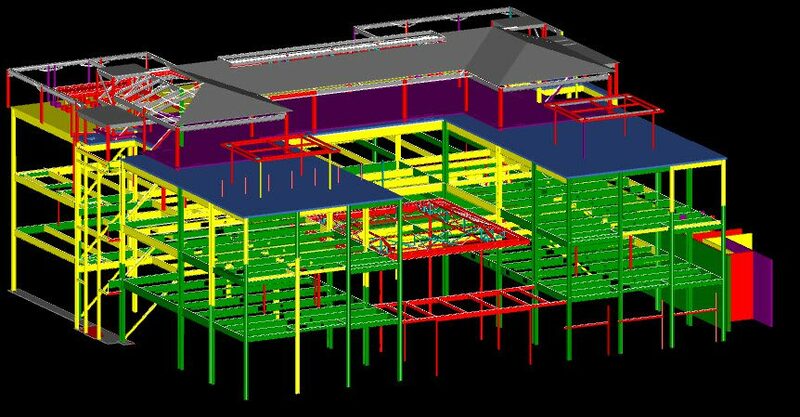 DPR then was able to process the new as-built model through Navisworks to perform a clash analysis with the building’s MEP design. This would ensure mechanical, electrical and plumbing systems fabricated offsite would fit the as-built conditions and be installed according to plan. Comparing the earlier manual inspection of the embed bolts with the automated analysis of the structural steel, DPR said that all 583 beams were reviewed in less time and with superior accuracy. The automated software saved time by avoiding potential delays in subsequent construction phases, Malys explains, and DPR also appreciated that Verity fits into its existing Navisworks QA/QC workflow. Kevin P. Corbley is the founder and owner of Corbley Communications. Corbley graduated from the University of Notre Dame with a Bachelors of Science Degree in Earth Science. He spent four years as a Journalist in Washington, D.C., covering the energy and aerospace industries before joining the Public Affairs Office at EOSAT, a geospatial firm in Lanham, Md. He established Corbley Communications in Denver in 1993.